You are here: Home / Ethnic Groups / The People of Bali and Nusa Tenggara / Who are The Balinese? The island of Bali is probably better known than the country of Indonesia. The word “Bali” brings to mind visions of a tropical paradise. Its beauty, friendly people, exquisite art and unique dance have made Bali a favorite destination for millions of tourists from around the world. On this “Island of the gods” reside the Balinese. However, many Balinese can also be found on the nearby island of Lombok, as well as in Lampung, Sulawesi, South Kalimantan, Sumbawa and Papua. The Balinese’ main livelihood is rice farming. Their irrigation system is called subak (sharing water resources). The solidarity among those who share water is displayed in their meetings and religious ceremonies. The natural beauty of Bali and the unique culture of the Balinese have provided the impetus for a booming tourist industry. The face of the island has been changed with the development of luxury hotels, souvenir shops, and other tourist related industries. Along with these changes have come a variety of employment opportunities. The Balinese are known throughout the world for their artistic abilities. Many Balinese villages specialize in one particular form of art. Their artistic talents can be seen in the variety of their paintings, carvings, sculpting, dancing, and weavings. 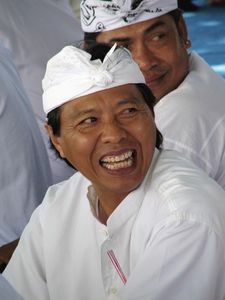 Hinduism is the primary religion of the Balinese. Even though Hinduism has greatly affected the culture, the Balinese have managed to maintain their original culture, so that Balinese Hinduism differs from Indian Hinduism. Balinese Hindus believe that there is one god that can be explained by the Trimurti, a concept of three aspects of God: Brahma, the creator; Vishnu, the protector; and Shiva, the destroyer. The Balinese practice Panca Yadnya (5 Ceremonies): 1) Manusia Yadnya (life cycle ceremonies); 2) Putra Yadnya (ancestral ceremonies); 2) Dewa Yadnya (ceremonies to gods who save the world); 4) Resi Yadnya (priest ordination); and 5) Buta Yadnya (ceremonies to protect against evil spirits).The impact of Hinduism can be seen throughout Bali. For example, each neighborhood has a dadia (communal shrine). Both individual families and larger assemblies use this shrine to offer food and flowers to their gods. A great need in Bali is a government plan for tourism development. Ironically, a key challenge is to maintain the integrity of Balinese culture in the face of the destructive forces that often accompany tourism. Well-conceived and well-executed laws could preserve the beauty and culture of Bali as well as promote its tourist trade for many years to come.